Born, raised and educated, I always say. Between Chicago and the suburbsâ€”Niles, Park Ridge, Glenview and Evanstonâ€”Iâ€™ve always lived within an 8-mile radius. Itâ€™s not exactly something I did by choice. I expected to go to college far, far away. February of my senior year, I auditioned at 10 music schools across the country. My mom bought new winter boots just for the traveling, telling me again and again to always keep my feet warm. Northwestern was only supposed to be my â€œpractice audition.â€ At only 15 minutes away from home, I never intended to end up there, but when I decided to switch majors, it soon became clear that Northwestern was perfect for me. When I found out Iâ€™d been accepted in April, I skipped my AP English class and called my mom to tell her the exciting news, expecting the same joy from her. But it didnâ€™t come right away. At that magic wordâ€”â€œNorthwesternâ€â€”my mom told me a story Iâ€™d heard a million times before. 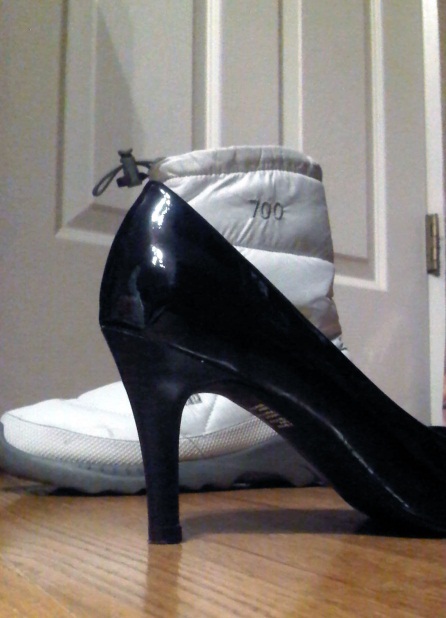 My patent pumps sit next to my winter boots, both gifts from my mother. The setting is Northwesternâ€™s former dental school in the winter. My young mother is scurrying through the chilly campus on her way to an exam. Wanting to look nice, she is wearing a slick new pair of pumps. But patent leather is not the best insulator, and her poor toes stayed numb for days. She maintains her feet have never been the same. Whether that was really the fault of the cold (I myself am banking on ill-fitting heels) remains unknown, but itâ€™s quite possible that my momâ€™s feet were truly shocked by the climate. You see, she grew up in the sunny Philippines, the daughter of a Chinese immigrant. When I venture out with my mom, as I did for my college auditions, it is obvious to me that people assume she is an immigrant, or even that I am an immigrant. On an exchange trip four years ago, a little Welsh boy trotted up to me and asked what country I was from. â€œAmerica,â€ I said. Confused, he ran to his mother. My host family explained to me that there werenâ€™t many Asians in Wales. At journalism camp in Indiana two years ago, a girl from Kansas City told me I was just â€œadorableâ€ because â€œitâ€™s so funny that youâ€™re Asian and have a Chicago accent.â€ Now I was confused. Was she serious? No, I do not speak Chineseâ€”nor does my mother. Sure, Chef Dad makes good fried rice, but his spaghetti is better. As for chopsticks, I didnâ€™t develop the fine motor skills needed to operate them until last year. Iâ€™ve never thought about citizenship tests, green cards or visas. My parents, as immigrants, surely have, but these are not the stories they tell me. These are not the stories that have defined them. The stories they tell me are not of hard realities of immigration. The stories are of feelings. Feelings that Iâ€™ve felt beforeâ€”like the fierce cold of a winter at Northwestern nipping at high-heel pinched toes, a sensation I first encountered through those repeated stories. Feelings that I hope to feel in the futureâ€”like lovesickness, the pangs of which Iâ€™ve felt through stories of my father driving 11 long hours from Toronto, where he lived in his 20s, to visit my mother in Chicago every weekend. These stories are light shining on dark times. Theyâ€™re a warm blanket of familiarity in a world of uncertainty. These were the stories that my father told me from his hospital bed last week, his voice rising and falling to the cadence of beeping machines. Theyâ€™re the stories my mom told me as she drove me from the Northwestern Memorial Hospital back to Northwestern University, literally circling back to where the story began. The stories my parents tell are not of memories that set us apart. The stories are of emotions that connect us, now and forever.